In our example, we interconnect three switches (Cisco ME3400 with me340x-metroaccess-mz.122-50.SE1.bin) to a ring topology. In REP terminology, this is called a segment. A REP segment is a chain of ports connected to each other and configured with a segment ID. Each segment consists of standard (nonedge) segment ports and two user-configured edge ports. A switch can have only two ports belonging to the same segment, and each segment port can have only one external neighbor. When all ports in a segment are operational, one port (referred to as the alternate port) is in the blocked state for each VLAN. If VLAN load balancing is configured, two ports in the segment control the blocked state of VLANs. If one or more ports in a segment is not operational, causing a link failure, all ports forward traffic on all VLANs to ensure connectivity. In case of a link failure, the alternate ports are unblocked as quickly as possible. When the failed link comes back up, a logically blocked port per VLAN is selected with minimal disruption to the network. Valid port states in REP segments are Failed, Open, or Alternate. A port configured as a regular segment port starts as a failed port. After the neighbor adjacencies are determined, the port changes to alternate port state, blocking all VLANs on the interface. Blocked port negotiations occur and when the segment settles, one blocked port remains in the alternate role, and all other ports become open ports. When a failure occurs in a link, all ports move to the open state. When the alternate port receives the failure notification, it changes to the open state, forwarding all VLANs. 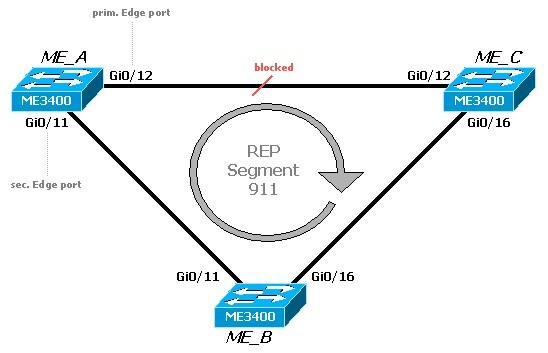 First, we configure all ring interfaces as REP ports with segment ID 911. All interface have to be Layer 2 trunk interfaces. To get REP working, we have to configure at least on edge port. For VLAN load-balancing, two edge ports are necessary. I decided to configure the two edge ports on switch ME_A. Ports on ME_B and ME_C are configured as standard segment ports. As you can see, port Gi0/12 on ME_A is in “Alt-state” and doesn’t forward traffic. (VLAN load-balancing is disabled per default). Hi everybody, does anybody know how to configure REP on a multiple segment topology? I mean a topology with multiple dual homed rings. Does it work? I was searching Cisco documentation about that, but I haven´t found how to configure. Cisco says REP can do it (in theory) but I´ve only found how to configure simple rings and I have an idea that some people I know test it but it didn´t work properly. I´m preparing a lab to test it but maybe someone can help me with any tip. Hello Does REP support dual home, have you test it? Listo, me funcionó. REP funciona en esquema de múltiples anillos en dual homing. REP works on multiple segment topology. Multiple dual homed rings do work with REP!!!! When we enable REP on a interface, how does STP or RSTP work on that interface?